On Maundy Thursday, together with hundreds of priests, living in Rome, I concelebrate with Pope Francis in the Chrism Mass in St. Peter’s Basilica. As what normally happens in Chrism Masses, priests all over the world renew their priestly vows before their bishops, the vows that they professed on the day of their ordination. What a blessing, what a grace, to renew my vows before the pope as I prepare myself for my 19th sacerdotal anniversary on April 25. While I delight in the truth that my priestly vocation is a product of God’s personal choice, of the love and mercy of a God who has chosen me from all eternity, I also believe that I was created, called and ordained to the priesthood for something much bigger than myself, for a plan much bigger than my own, for I was ordained as a priest for the church, for humanity. What is the meaning of ministerial priesthood? I ask this question conscious of the fact that it takes at least a semester of attending a course on Holy Orders in the seminary program to answer the question. One way of approaching the question is by looking at the scholastic distinction between ex opere operato and ex opere operantis, a distinction about which my professors in Sacramental Theology and priesthood spent so much time arguing to bring out one of the most amazing insights on the sacraments and on priesthood. Ex opere operato means that the sacraments produce grace of themselves, independent of the holiness or worthiness of the minister, of the priest. This principle is given by the church to instill the truth that regardless of the spiritual status of the minister before the Lord, no matter how sinful the priest may be, the sacraments that he celebrates are valid and efficacious for as long as he celebrates them using the correct form and according to the intention of the church. This intrinsic efficacy of the sacraments is Christ’s assurance that he will act in the sacraments independent of the worthiness of his minister. Christ’s faithful are not at the mercy of the holiness of the priest for their own pursuit of holiness. Simply put: the Christian community’s pursuit of holiness does not depend on the holiness of its priest, on the holiness of any priest for that matter, because the efforts of priests and their holiness do not produce the effects of the sacraments, but Christ’s power. Indeed, while we challenge the church’s ministers to be holy themselves for spiritual, liturgical and pastoral reasons, which is what the principle ex opere operantis affirms, theology teaches us that the holiness of the church does not depend and will never depend on the holiness of her priests. Why is this so? As I grow old in my priesthood, I have come to realize and have become more convinced that the risen Jesus’ promise to his disciples that he would always be with them -- and by extension with the church -- until the end of time is, in some mysterious ways, fulfilled in the ordained ministry of the priests. That the sacraments and the sacramentals work ex opere operato guarantees us that there will never come a time in the church’s life when she will ever be deprived of God’s grace -- of God’s sustaining, healing, and sanctifying grace -- because God will use even weak, unworthy, sinful and undeserving priests as instruments and vessels to communicate his grace to the church, to the world; that even when priests are sinful themselves, even when priests are in the state of sin, God will continue to grace the church through the sacraments that they celebrate that work efficaciously for the sanctification of the church and her members. The ordained priesthood, indeed, is one of the most efficacious ways by which the risen Christ continues to fulfill his promise to the church -- that he will be with her until the end of time. How wonderful it is that we, priests, have been incorporated in the marvelous plan of God, of a God who can make big things through our smallness, who can work wonders through our unworthiness, who can write straight in the lives of others through the crooked lines of our own. How humbling it is to know that God has used me and continues to use me despite my sinfulness and unworthiness so that his people may continue to grow in their sanctification. At the end, it tells us only one thing about us, priests: that our priesthood is not for us, but for others; that God called us as his priests not exclusively, or even primarily, for our own holiness, but for the holiness of the church. We can say this though about the other ministries of the church too. In the final analysis, we are really servants of the church, servants of the Christian community, and when we understand this insight in a profound way, we will be essentially and totally at the disposal of others, of the church and of humanity, in their collective pursuit of holiness. Like the Lord whom we follow, we have been ordained as priests to serve and not to be served. Hence, a priest who always puts his personal schedule before all else, a priest who always puts his needs above those of his community, and therefore fails to attend to the pastoral and spiritual needs of his people, is a contradiction in terms. For all the length and expenses of his formation, he has not understood the essence, the meaning and the implications of his ministerial priesthood. 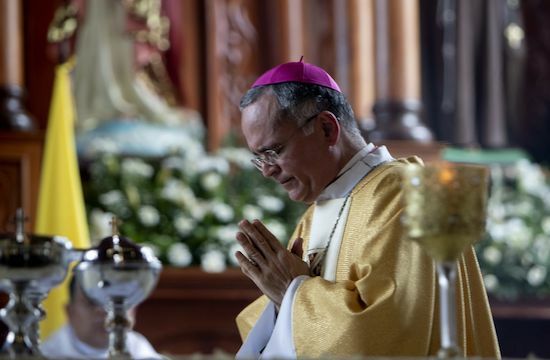 Father Salvador Agualada Jr. is a Filipino Claretian priest who is currently pursuing his doctorate in Dogmatic Theology at the Pontifical Gregorian University in Rome.